I love thick and creamy vegetable soups. But, I don’t always love the calories. So, this week I decided to substitute heavy cream with a smooth cauliflower purée instead. 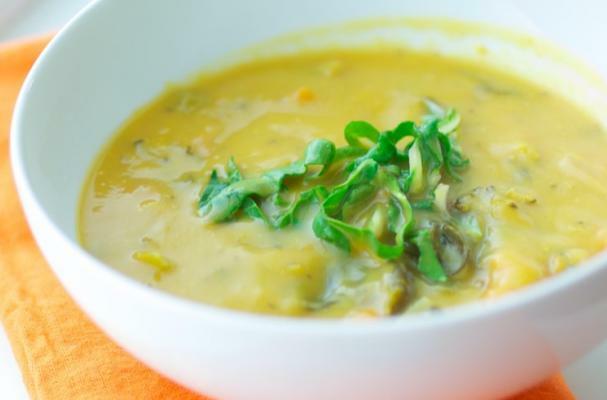 If you are looking for a healthy lunch or dinner meal, give this simple soup a try. Swiss chard – Swiss chard, thanks to their dark green color, are uber-rich in chlorophyll, a natural detox agent. Cauliflower – Cleansing beauties embrace cauliflower for its high sulfur and anitoxidant content which is believed to help boost your body’s detoxification work. Add sea salt, pepper, thyme, sweet potatoes and broth to the pot. Cover pot and bring the broth to a boil. Reduce heat back to medium and cook 25 to 30 minutes longer or until potatoes are tender. When potatoes are fork tender, add broccoli, cauliflower purée and remaining chard and cook for another 10 to 15 minutes stirring occasionally. I love this soup with a dash of freshly grated cheese and slice of toasty bread. Enjoy! For more healthy, low calorie recipes visit GreenLemonade.com.